Italia! 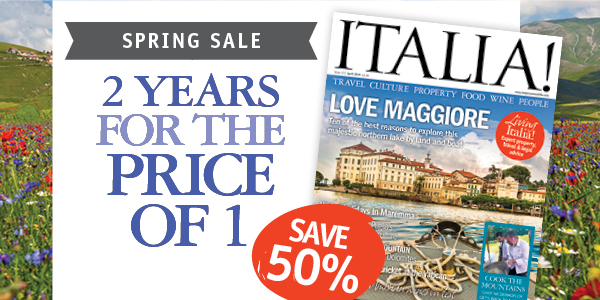 magazine is the award-winning magazine for everyone who has a passion for Italy. Each month, you’ll find a wide variety of beautifully photographed and intelligently written articles to inspire and inform you. 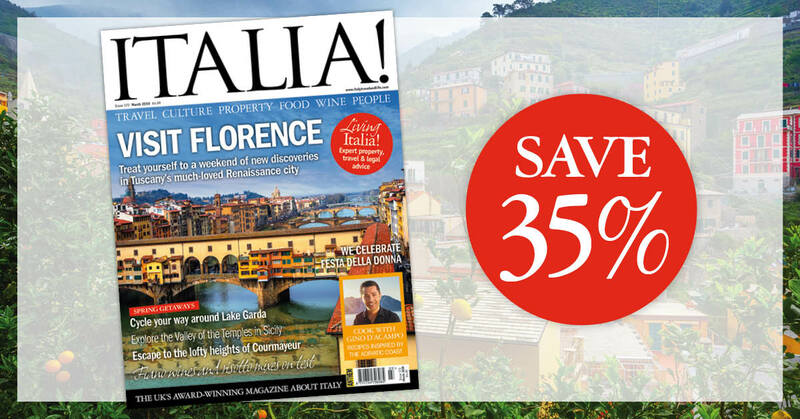 Covering every aspect of Italian life, from travel, holidays and property to food, wine and culture, we bring Italy closer to English-speaking readers across the world. Free gift when you subscribe to Italia! magazine this month! 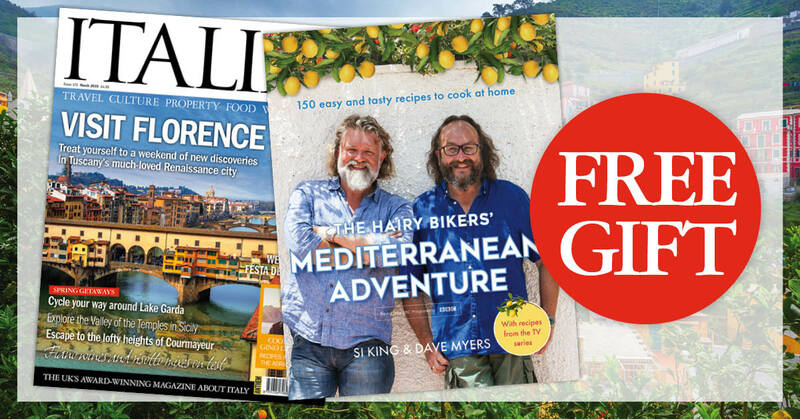 When you subscribe this month you can get this free Hairy Bikers Mediterranean cookbook worth £25. The Hairy Bikers have been on their bikes again, searching out the very best recipes from around the world. This time, they’re discovering the most delicious food from our favourite Mediterranean countries. Including recipes from their prime time BBC Two cookery show, Hairy Bikers Mediterranean Adventure celebrates the culinary delights of France, Spain and Italy. With more of us understanding the health benefits of a Med diet, these hearty and healthy dishes are a taste of the very best holiday memories. Fresh, classic, easy and seasonal, enjoy our favourite Med recipes with the nation’s favourite cooking duo! CLICK HERE TO SUBSCRIBE + GET YOUR FREE GIFT! Offer code ITL1903WEB. Offer ends 30 April 2019. The free gift is available to UK Direct Debit orders only. We reserve the right to substitute the gift with an alternative of similar value if stocks become exhausted. 20% saving is available to UK customer paying by Direct Debit only. You will pay just £24 every 6 months saving 20% off the UK cover price. Your subscription will start with the next available issue. You will receive 12 issues of Italia! per year. Minimum subscription term is 12 months. Great offers for international delivery on Italia! Sorry, the gift is available in the UK only. But we have a great 35% discount offer for you! Offer code ITL1903OSBN. Offer ends 30 April 2019. All savings are based on the local cover price for Europe, USA/Canada and Australia. The rates listed above are available on recurring payment (by continuous credit card) every 6 months only. Your subscription will start with the next available issue. You will receive 12 issues of Italia per year. The Italia! Spring Sale starts now! 2 for 1 offer is only available to UK, USA, Australia and Europe in local currency. Offer is based on the cover price multiplied by 2 years’ worth of issues divided by 2, thereby saving 50% off the store price. Your subscription will start with the next available issue. You will receive 12 issues of Italia! per year. Want to know more about Italia magazine? Check our previous issues, click here to view back issues of Italia! magazine. We also have a fantastic Italia! magazine app where you can download the latest issue of Italia! magazine or subscribe to the digital edition. Why subscribe to the app?